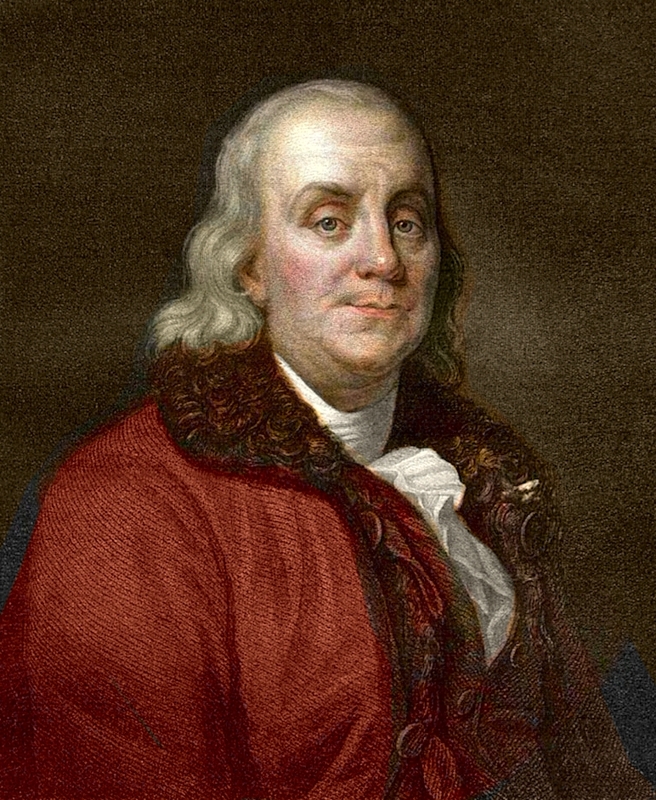 Benjamin Franklin (born in Boston, Massachusetts Bay, died in Philadelphia, Pennsylvania) was a famous Politician from USA, who lived between January 17, 1706 and April 17, 1790. He became 84 years old. He was one of the leaders of the American Revolution, and he is also remembered for his experiments with electricity. Benjamin was the fifteenth of 17 siblings. He soon had to start working, as 12-year-old boy he started working as a soap-maker and a candle-maker at he's fathers shop. He received his education in London, and afterwards he started his own print shop in Philadelphia. It was soon to become one of the best. There, he started the company that twelve men discussed politics and science, and this group he started with his electrical experiments. He realized that lightning was the discharge, and proposed to put a man on a resin plate on top of a tower to test whether the clouds were electric. This led later to at least one fatality. Franklin himself created the world's first lightning rod, and invented bifocal glasses and an instrument called glassharmonika. He is known for the phrase "time is money" from the book Advice to a young tradesman. He is born under the zodiac capricorn, who is known for Determination, Dominance, Perservering, Practical, Willful. Our collection contains 163 quotes who is written / told by Benjamin, under the main topics: Happiness, Beauty, Food, Funny, Home. "Happiness depends more on the inward disposition of mind than on outward circumstances"
"Guests, like fish, begin to smell after three days"
"There are three faithful friends - an old wife, an old dog, and ready money"
"Beauty and folly are old companions"
"A good conscience is a continual Christmas"
"A great empire, like a great cake, is most easily diminished at the edges"
"A house is not a home unless it contains food and fire for the mind as well as the body"
"A learned blockhead is a greater blockhead than an ignorant one"
"A life of leisure and a life of laziness are two things. There will be sleeping enough in the grave"
"A man wrapped up in himself makes a very small bundle"
"Admiration is the daughter of ignorance"
"All mankind is divided into three classes: those that are immovable, those that are movable, and those that move"
"All wars are follies, very expensive and very mischievous ones"
"All who think cannot but see there is a sanction like that of religion which binds us in partnership in the serious work of the world"
"And whether you're an honest man, or whether you're a thief, depends on whose solicitor has given me my brief"
"Anger is never without a reason, but seldom with a good one"
"Any fool can criticize, condemn and complain and most fools do"
"As we must account for every idle word, so must we account for every idle silence"
"At twenty years of age the will reigns; at thirty, the wit; and at forty, the judgment"
"Be at war with your vices, at peace with your neighbors, and let every new year find you a better man"
"Be slow in choosing a friend, slower in changing"
"Buy what thou hast no need of and ere long thou shalt sell thy necessities"
"Content makes poor men rich; discontent makes rich men poor"
"Creditors have better memories than debtors"
"Even peace may be purchased at too high a price"
"Experience keeps a dear school, but fools will learn in no other"
"Fatigue is the best pillow"
"For having lived long, I have experienced many instances of being obliged, by better information or fuller consideration, to change opinions, even on important subjects, which I once thought right but found to be otherwise"
"Gain may be temporary and uncertain; but ever while you live, expense is constant and certain: and it is easier to build two chimneys than to keep one in fuel"
"Games lubricate the body and the mind"
"God works wonders now and then; Behold a lawyer, an honest man"
"A countryman between two lawyers is like a fish between two cats"
"He that raises a large family does, indeed, while he lives to observe them, stand a broader mark for sorrow; but then he stands a broader mark for pleasure too"
"He that rises late must trot all day"
"He that speaks much, is much mistaken"
"He that waits upon fortune, is never sure of a dinner"
"He that won't be counseled can't be helped"
"He that would live in peace and at ease must not speak all he knows or all he sees"
"He that's secure is not safe"
"He who falls in love with himself will have no rivals"
"Hear reason, or she'll make you feel her"
"I wake up every morning at nine and grab for the morning paper. Then I look at the obituary page. If my name is not on it, I get up"
"If a man could have half of his wishes, he would double his troubles"
"If a man empties his purse into his head, no one can take it from him"
"If all printers were determined not to print anything till they were sure it would offend nobody, there would be very little printed"
"If time be of all things the most precious, wasting time must be the greatest prodigality"
"If we do not hang together, we shall surely hang separately"
"If you desire many things, many things will seem few"
"If you know how to spend less than you get, you have the philosopher's stone"
"If you would be loved, love, and be loveable"
"It is only when the rich are sick that they fully feel the impotence of wealth"
"It is the eye of other people that ruin us. If I were blind I would want, neither fine clothes, fine houses or fine furniture"
"It is the working man who is the happy man. It is the idle man who is the miserable man"
"It takes many good deeds to build a good reputation, and only one bad one to lose it"
"Keep your eyes wide open before marriage, half shut afterwards"
"Laws too gentle are seldom obeyed; too severe, seldom executed"
"Leisure is the time for doing something useful. This leisure the diligent person will obtain the lazy one never"
"Life's Tragedy is that we get old to soon and wise too late"
"Many a man thinks he is buying pleasure, when he is really selling himself to it"
"Nine men in ten are would be suicides"
"Observe all men, thyself most"
"Our necessities never equal our wants"
"Rather go to bed with out dinner than to rise in debt"
"Rebellion against tyrants is obedience to God"
"Remember not only to say the right thing in the right place, but far more difficult still, to leave unsaid the wrong thing at the tempting moment"
"Remember that credit is money"
"Savages we call them because their manners differ from ours"
"The doors of wisdom are never shut"
"The doorstep to the temple of wisdom is a knowledge of our own ignorance"
"The eye of the master will do more work than both his hands"
"The first mistake in public business is the going into it"
"The strictest law sometimes becomes the severest injustice"
"The U. S. Constitution doesn't guarantee happiness, only the pursuit of it. You have to catch up with it yourself"
"The use of money is all the advantage there is in having it"
"The way to see by Faith is to shut the Eye of Reason"
"The worst wheel of the cart makes the most noise"
"To Follow by faith alone is to follow blindly"
"To lengthen thy life, lessen thy meals"
"To succeed, jump as quickly at opportunities as you do at conclusions"
"Tomorrow, every Fault is to be amended; but that Tomorrow never comes"
"Tricks and treachery are the practice of fools, that don't have brains enough to be honest"
"Trouble springs from idleness, and grievous toil from needless ease"
"Wars are not paid for in wartime, the bill comes later"
"We are all born ignorant, but one must work hard to remain stupid"
"We are more thoroughly an enlightened people, with respect to our political interests, than perhaps any other under heaven. Every man among us reads, and is so easy in his circumstances as to have leisure for conversations of improvement and for acquiring information"
"Where sense is wanting, everything is wanting"
"Where there's marriage without love, there will be love without marriage"
"Who is rich? He that is content. Who is that? Nobody"
"Who is rich? He that rejoices in his portion"
"Who is wise? He that learns from everyone. Who is powerful? He that governs his passions. Who is rich? He that is content. Who is that? Nobody"
"Wine is constant proof that God loves us and loves to see us happy"
"Wise men don't need advice. Fools won't take it"
"Words may show a man's wit but actions his meaning"
"They who can give up essential liberty to obtain a little temporary safety deserve neither liberty nor safety"
"Those that won't be counseled can't be helped"
"He that has done you a kindness will be more ready to do you another, than he whom you yourself have obliged"
"He that is of the opinion money will do everything may well be suspected of doing everything for money"
"It is easier to prevent bad habits than to break them"
"It is much easier to suppress a first desire than to satisfy those that follow"
"Necessity never made a good bargain"
"There was never a good war, or a bad peace"
"Those who govern, having much business on their hands, do not generally like to take the trouble of considering and carrying into execution new projects. The best public measures are therefore seldom adopted from previous wisdom, but forced by the occasion"
"Work as if you were to live a hundred years. Pray as if you were to die tomorrow"
"When befriended, remember it; when you befriend, forget it"
"When will mankind be convinced and agree to settle their difficulties by arbitration?" "You can bear your own faults, and why not a fault in your wife?" "Distrust and caution are the parents of security"
"Having been poor is no shame, but being ashamed of it, is"
"He that lives upon hope will die fasting"
"If you would not be forgotten as soon as you are dead, either write something worth reading or do things worth writing"
"Your net worth to the world is usually determined by what remains after your bad habits are subtracted from your good ones"
"I look upon death to be as necessary to our constitution as sleep. We shall rise refreshed in the morning"
"In this world nothing can be said to be certain, except death and taxes"
"Never take a wife till thou hast a house (and a fire) to put her in"
"The absent are never without fault, nor the present without excuse"
"Dost thou love life? Then do not squander time, for that is the stuff life is made of"
"He that displays too often his wife and his wallet is in danger of having both of them borrowed"
"I conceive that the great part of the miseries of mankind are brought upon them by false estimates they have made of the value of things"
"Take time for all things: great haste makes great waste"
"There never was a truly great man that was not at the same time truly virtuous"
"Each year one vicious habit discarded, in time might make the worst of us good"
"He does not possess wealth; it possesses him"
"How few there are who have courage enough to own their faults, or resolution enough to mend them"
"Human felicity is produced not as much by great pieces of good fortune that seldom happen as by little advantages that occur every day"
"She laughs at everything you say. Why? Because she has fine teeth"
"We must, indeed, all hang together or, most assuredly, we shall all hang separately"
"Employ thy time well, if thou meanest to gain leisure"
"I should have no objection to go over the same life from its beginning to the end: requesting only the advantage authors have, of correcting in a second edition the faults of the first"
"If you would know the value of money, go and try to borrow some"
"Money has never made man happy, nor will it, there is nothing in its nature to produce happiness. The more of it one has the more one wants"
"Most people return small favors, acknowledge medium ones and repay greater ones - with ingratitude"
"Some people die at 25 and aren't buried until 75"
"The discontented man finds no easy chair"